Not only does your skin benefit from proper hydration, but so does your overall health. Especially at higher altitudes, it’s important to drink plenty of fluids for your body to be properly hydrated. Also, be conscious of the amount of caffeine and alcohol you drink, which could dehydrate you in excessive quantities. 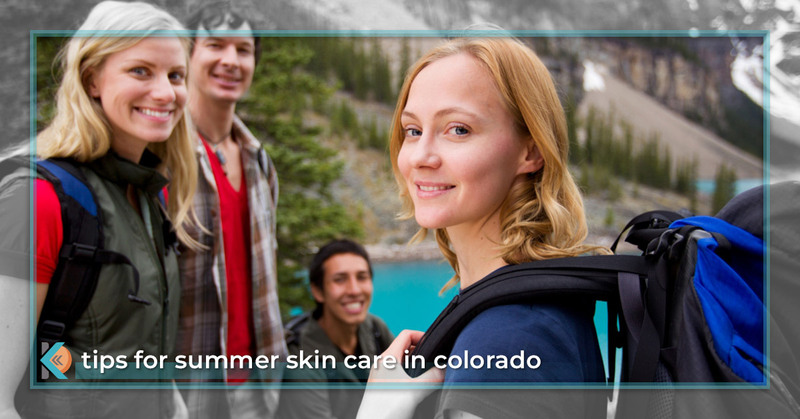 Colorado is populated by people from all over the country, and some new residents find that their skin is more sensitive to the drier climate. The face wash you used in a humid climate may no longer be suited to your skin. Wash your face with a gentle, hydrating cleanser free of detergents if you have sensitive skin. Immediately after taking a shower, towel dry your skin and apply a moisturizer to your body while your skin is still slightly damp. For those of you suffering from excessively dry skin, you could apply a body oil first and then follow up with a cream or lotion. For your face, apply a moisturizing serum followed by a lotion or cream. The serum helps lock in the moisture. If your skin still feels super dry, try running a humidifier in your home. Another way to add more humidity to your home is to buy houseplants, which will also brighten up your living space. When you are spending a ton of time outdoors, you may want to shower as much as possible, which could be drying out your skin. Although frequent bathing is great (and we appreciate it very much), don’t go overboard. When showering or taking a bath, don’t spend too much time in the tub. The longer you are bathing, the more your skin will dry out, particularly if you are using hotter water. You could even boost your skin’s moisture content by adding some cold-pressed coconut oil to your bath water. If your dry skin is out of control or you are experiencing skin conditions that won’t go away on their own, contact Kallgren Dermatology today. Our experienced dermatologists in Boulder are happy to help get your skin back on track and we also offer a variety of cosmetic services including Botox®, Juvederm®, chemical peels and more. You’ll feel at home as soon as you walk through our doors and are greeted by our friendly staff. Call our Boulder Dermatology clinic today.